Every year since 1990, the Peach State Summer Theatre has presented musicals for all to see. The season lasts for ten weeks and during that time, they present three different musicals. During this season, sixty people will help bring Shrek the Musical, Forever Plaid, and My Fair Lady alive on the stage for audiences to enjoy. Every art lover will need to visit the 17,000 square feet of space inside the Turner Center for the Arts building. There are six galleries in total and they show both old and new regional and international works of art. Included in the permanent exhibits are East African art and European porcelains. There are thirty different exhibits displayed every year and they are rotated out to ensure that people are always seeing something new when they visit. Business began at the South Georgia Pecan Company back in 1913 and they now have four plants located within a one-and-a-half-mile radius in Valdosta. Each plant does something different including cleaning in-shell pecans, shelling pecans, packaging, and grinding. People can stop in and purchase nuts and other items from the gift shop during their visit. Animal lovers will love this educational center, but the best part of the entire place is the fifty-four-foot tower. People can go to the top of the tower to see spectacular views of the surrounding area. There is also a half mile boardwalk for people to stroll along in between their time in the tower and education center. Outdoor enthusiasts always find themselves somewhere in the middle of Freedom Park, because there is always something going on there. There are eight baseball fields, multiple soccer fields, a disc golf course, and a playground and each one is waiting for a group of people to arrive and start playing. There are also tournaments in these areas and people are encouraged to stop by to watch all the fun and excitement. In addition to the sporting events, there are hiking and walking trails that people can walk along either by themselves or with family and friends. Dog owners have fallen in love with the large dog park, especially since it has sections for both large and small types of dogs. The history of Valdosta comes alive in this 10,000-square foot building and people are encouraged to take their time as they look at photographs and documents from the past to the present. In addition to all of that, there is also a large library that is filled with government documents, genealogy records, and books waiting for someone to come in to do some research. The Crescent was built in 1898 by William S. Nest. The building has twenty-three rooms and has been part of the National Register of Historic Places since 1980. This is where many of the local garden clubs meet and there are numerous events like flower shows and antiques sales held there every year. The landscaped gardens are perfect for parties and weddings, so people should be prepared to be quiet while wandering around if a special event is happening. The Barber-Pittman House can be found on North Ashley Street and it was built in 1915 for E. R. Barber. Mr. Barber was the first Coca-Cola bottler outside of Atlanta and he was also an inventor. Upon his death, the house went to his daughter Ola, and she did everything in her power to keep the house from being demolished and replaced with a parking lot. In 1977, she left her house to the citizens of Valdosta with explicit instructions of how it was to be used. This house can never be controlled by the government or sold and if anyone tries to do so, it automatically reverts to her estate. Valdosta Wake Compound started in 2011 with a 2 tower system on a 10 acre fishing lake. While running the two tower wakepark, VWC acquired and developed a 30 acre facility with custom developed ponds and a 6 tower Full sized cable system where they are currently located today. The crew at Valdosta Wake Compound is constantly pushing the sport and the facility alike and have come to develop a moto of "dedicated to progression", which is fundamental to the day to day operations at the compound. No one can ever forget to mention the Wild Adventures Theme Park in Valdosta and people love to visit there to go on the rides, see the animals, and watch the shows. New for this year is an expanded water park and even more animals. There are many special events planned for the season including two days of BBQ Country and the Stars of Wrestling. Valdosta has so much to do and there is always something happening in the city. It is best if people make a list of what they want to do and then put it in the order of importance to them, so that they can see at least the top items on their list while they are visiting. 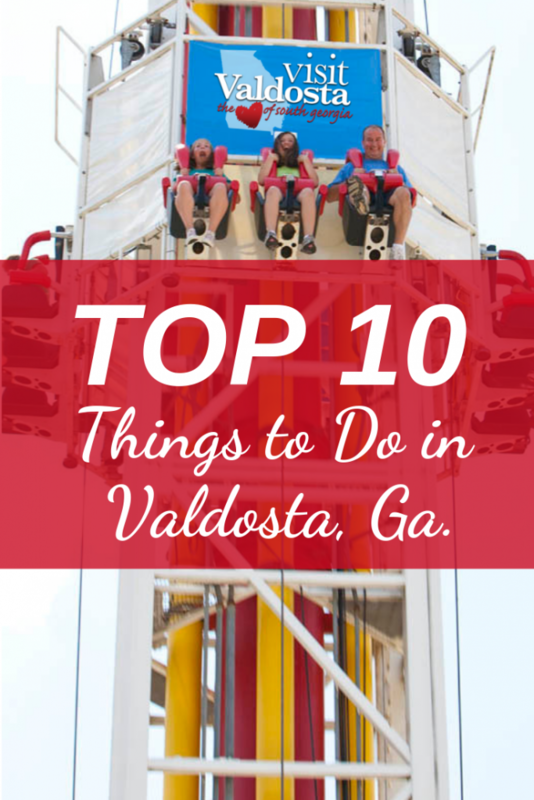 Find more great things to do in Valdosta.